It’s costing more to make U.S. coins for circulation. Unit costs climbed for every denomination, the United States Mint disclosed in its 2017 Annual Report, and the cost of making cents and nickels remained above their face values for a twelfth year in a row. 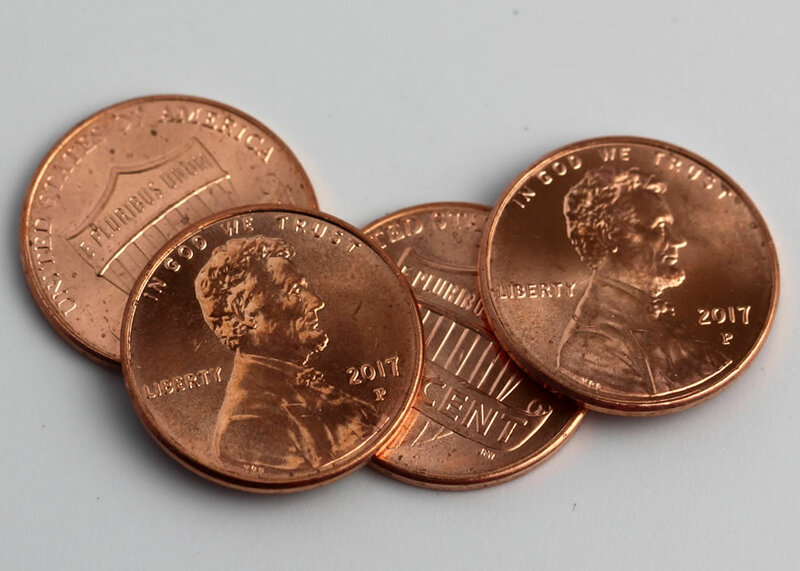 The toll to produce, administer and distribute the 1-cent coin was 1.82 cents in FY 2017 compared to 1.50 cents a year earlier. For the 5-cent coin, the cost went up to 6.60 cents from 6.32 cents. Higher metal prices were one factor in the increases. "Compared to last year, FY 2017 average spot prices for nickel increased 10.3 percent to $10,214.20 per tonne, average copper prices rose 21.3 percent to $5,782.69, and average zinc prices increased 45.4 percent to $2,715.62," the U.S. Mint’s annual report noted. Lincoln cents are composed from 2.5% copper with the balance zinc and 5-cent coins are made from 25% nickel with the balance copper. As has been the case for several years now, the U.S. Mint made money only on dimes and quarters since their respective unit costs at 3.33 cents and 8.24 cents are lower than their face values. The following two tables summarize U.S. Mint costs for the cent through quarter with the first table for FY 2017 and the second one for FY 2016. In profit from seigniorage — the difference between the face value and cost of producing circulating coins, the dime realized $160.5 million while the quarter brought $322.7 million. The Mint transfers seigniorage to the Treasury General Fund to help finance national debt. In contrast, the two smallest U.S. coins have lost money since 2006. 1.926 billion quarters, down 22.4% from the previous year. The four denominations combined to 14.068 billion coins, marking a 13.7% decrease from the 16.308 billion coins delivered in FY 2016. The Fed pays face value for each coin they receive, with the Mint realizing FY 2017 circulating revenue of $871.8 million — down 21% from $1,104.2 million in FY 2016. After subtracting the year’s cost to produce all four coins, which totaled $480.3 million, the U.S. Mint’s circulating profit or seigniorage reached $391.5 million for a 32.4% drop from the previous year’s $578.7 million. The resulting seigniorage per dollar issued reached $0.45, down from the prior year’s $0.52. I never really understood why the mint never sold cents, nickels and dimes to collectors, like they sell quarters, halves and dollar coins to collectors. I definitely would buy them instead of having to wait for months for banks to get them. Living in South Dakota, I didn’t see any 2017 P cents till about September. I hate having to wait for the mint sets to get the current year’s coins to update my sets. It seems to me that the US mint will follow suit with my RCM and delete the production of the penny. Costs more to make than its worth. Stock up on those penny rolls folks as they will be a thing of the past. Don’t see to many “wheaties” anymore. Those I save and always thought they may do a commemorative wheat cent. Possibly include it in a silver set. I do hang on to copper cents (1981 and earlier). Coppers are still plentiful. Problem with saving the old cents is the weight. Some day I will drag them in to a scrap dealer and end up getting two cents each. 12 years! & *millions of $. for each ton of *zinc,*copper*nickel! = the $0.1/4 + $0.0.5 = First! two, too! go. 12 years of $$$$$$. *Washington* & 12 years of $$$$$$.Tom* the 2 most$costly = Trillion $$ of our* $*deafahsit*$, = too,to,late! Leave it to! *Ab & *young*Teddy + for now. dennis & Rooster – if you throw *us*mint* sets in to circulation not many would know the diffrinse at first & later on no! one would know the diffrinse! Rooster! – separate your 1982 *Lincoln*s coppers from the 1982 zinc *Lincoln*s, you never know what a pond of copper will go for someday! i* mean its a few bucks now but can*t melt*yet. Joe Brown: I like the way you are thinking but I just have to draw the line somewhere. I also have scrap copper cable and it pains me that those pennies are about equal. The U.S. Mint floated that very idea in days gone by and ran into some vehement opposition to the very notion of doing that; as a result the plan was effectively vaporized before it ever had a chance to get off the ground. We Americans apparently do crave our cents. Incidentally, we haven’t had a “penny” as such here in the good old U.S.A. for a couple of centuries now. You’re right…a roll is a roll, and how hard would it be to sell rolls of cents, nickels and dimes? Not to mention it would give the Mint some other much-needed moneymakers. I don’t see the US ditching the penny in the foreseeable future. The mining lobby and the Illinois Congressmen will protect their own interests. And some people think rounding change to the nearest nickel will somehow cheat people. It won’t, because the losses and gains will cancel each other out. As it is, you can’t do anything with a penny except save it until you have enough to exchange them for “real” money. I’m guessing that there are more than a few rather unscrupulous secondary – or tertiary etc. – market sellers out there who actually do the reverse, which is to say that they pop circulating coinage into uncirculated holders and seal uncirculated coins into proof displays (and from what I hear think nothing of fixing fake precious metal coins into clever PGS/NGC knock-off slabs). Isn’t it bad enough that we already have to be so very careful not to get stuck with sub-quality sight-unseen purchased coins, now we also have to concern ourselves with the quite distinct possibility of getting stiffed with a complete zero, an imitation, in the basic authenticity department. Larry – it looks like we type the same ideas at the same time, haha!. Great minds, and all that. “typed”. Grr. Why doesn’t this board offer an “edit” option? Old Collector – if their are ! I*ll wait, for my copper*Lincoln*s, to be a*o*k by our *Fed*s, not worth it! Your right about the other stuff. One simple question. Why does the cent coin even exist if you can’t buy anything with it? Sure, I appreciated having them back in the early fifties so that I could buy my favorite pieces of Bazooka chewing gum with them, but where can you find a one cent piece of candy etc. now? Just wondering. Old Collector – now we get back 9 – cents on a dime*. Not long after 2006 when the cost of producing the Lincoln cent & Jefferson nickel went above their face value, the U.S. Government made it illegal to melt any U.S. Mint 1-cent or 5-cent coins! And the U.S. Treasury Department also imposed limits of how many of those two denominations of coins you can take out of the USA. We don’t even legally “own” all the rights to our own cents & nickels to do with as we please. Democracy?! If the cent was gone businesses would no doubt adjust pricing so products would round up a lot more often than down. Capturing that little bit of money for those transactions will add up quickly especially for large companies. Old Collector – very wise and true. The most we can hope for with the north american 2 per cent is hopefully more Bill Gates. The man provides more support and international aid than the entire American government and mine as well (Canada) combined. Hopefully the younger generation will improve where we leave off . . .especially with coinage. I wait for the day that the next great historical coin is designed and minted for and by the next generation….and always – equality for all. Teach our children well / humble / kind / empathy and compassion / and that we are all in this life together. History of coinage helps me teach my son this, pure in your hands history. Should the penny continue to be produced for 2018? Barry, when people buy combinations of things, it’s completely random what number the total will end in. Even if every price ended in 5, the sales tax would still make it random. Sometimes it would be rounded up, and sometimes down. How do the Eurozone countries that quit minting the one and two cent coins survive? If you live in Florida and you are short a penny at checkout, guess what you don’t get your product too bad. Oh well it’s the south!!! In some stores, if your total ends in $.01, they don’t bother giving all that change, they give you a full dollar as if it were $.00. But not at self-checkout. The machines are exact. Sweden’s not part of the eurozone but doesn’t have 1- or 2-cent equivalents. I haven’t been there since they started the transition to widespread electronic payments, but at the time I visited there was a national rounding law. Receipts had to show both the unrounded and rounded totals for verification. Of course if something equivalent were tried here there’d be volcanic complaints about “government interference”, “taking away freedom”, etc. etc. etc. etc. I collect Indian head cents..use to pay 50 cents for each one..many now worth over 100 dollars. Munzen: Part of the problem, maybe the entire problem, is that Congress has to get involved for any changes to currency and coin to be made. I don’t think that’s the case in Canada. I don’t know about other countries. And Congress is definitely influenced by lobbyists (understatement), which is also why we still have one dollar bills instead of coins, and paper currency instead of polymer. Australia has led the world in polymer currency, and a lot of other countries have at least tried it on a few issues, including Canada and the UK. Instead, we continue to produce billions of one dollar bills each year to replace worn out paper bills. Wow, folks, the existence – or not, for that matter – of the little old American penny has initiated a terrific ongoing, varied and multi-layered conversation here the likes of which I’ve not very often seen. I love it! Old Collector: That’s because that little old penny is a symbol of America’s unwillingness to adapt, and the outdated processes we have in place. Whenever Congress is involved, any change will be long in coming, expensive, and most likely unsatisfying to all. Please run for office; I’m definitely voting for you! Old Collector: I couldn’t look myself in the mirror if I were elected. I have to be able to respect myself. The sales tax argument doesn’t really make sense to me as an argument for keeping the one cent coin around. The business ultimately remits the tax to the state, not the individual, so it wouldn’t take much for either businesses to adjust prices on all their products/services to include the sales tax they expect to pay or for state governments to create a much smaller sales tax but applied to all sales of products/services from businesses that they then can remit quarterly to the state (with their pricing adjusted accordingly). The surcharge system as it exists now is silly.